The Canon team is very knowledgeable and familiar with their products, allowing us to cultivate a good relationship and partnership. Their staff are all very helpful, friendly and responsive. Swagelok Singapore manufactures and sells fluid system components, assemblies and related services on a massive scale. With a directed focus on marketing and distribution, Swagelok Singapore plays a vital role in maintaining high standards of customer service that aligns with Swagelok Company, a billion-dollar global MNC. Be it in the way Swagelok Singapore operates or the way they handle customer experience, their mission is simple – to provide excellent solutions by leveraging on resources, strengths and capabilities. Swagelok Singapore has a customer database of over 1,600 customers, comprising approximately 300 to 500 key customers with whom they have daily transactions. This significant volume of customers culminates in a massive amount of paperwork, which in turn takes up valuable space. The documents were in a hard-copy format, which ended up being filed up and stored in boxes due to space constraints – space that could otherwise be used to house more staff or equipment. In terms of document retrieval, there were some documents that could be referred to on computers but if the staff needed a signed copy, they had to retrieve a physical copy which could be buried among stacks of files. The staff had to first locate the box (out of many boxes) in their warehouse or cupboards, take out everything just to find the specific file before putting everything back again. This resulted in a tiresome process and significant time wastage that took up to 2-3 man-hours per person a day. Swagelok Singapore did a comparison and found Canon to be a one-stop solution. Canon provided both the software and hardware in one package; other providers mostly offered them separately. In addition, Canon’s hardware and software were able to meet Swagelok Singapore’s requirements, which was something that lacked from the others. With the implementation of Canon’sTherefore™ Document Management Solution, files are now archived digitally, eliminating manual filing and retrieval while saving both valuable space and time. Human errors are avoided as well, resulting in a win-win situation. 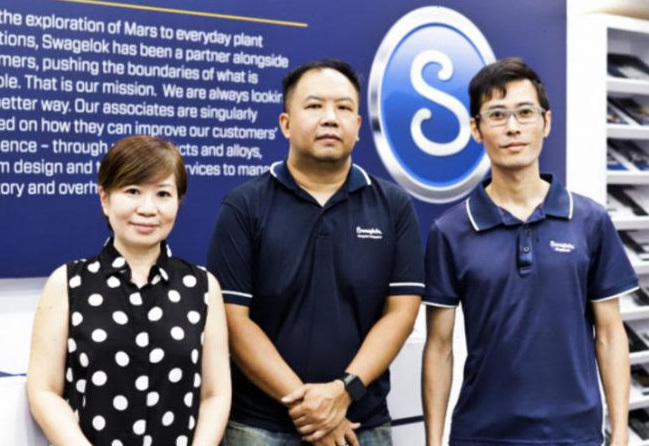 For Swagelok Singapore, it only made sense to implement digitisation for the company to ensure that their staff focus on their daily tasks at hand. In this light, Canon’s Therefore™ Document Management Solution proved immensely useful in helping Swagelok Singapore to streamline processes and improve productivity levels. The solution also helped to improve overall customer service satisfaction levels. Instead of spending precious time on filing and manual sorting, customer service staff are now able to focus on helping customers resolve their issues. Embracing digitisation can be intimidating for companies, with many meeting resistance from current employees. However, with the help of Canon, Swagelok Singapore was able to make the shift seamlessly and efficiently. Employees’ reception and confidence levels were boosted by a comprehensive initial training session conducted by the Canon team, which was supplemented by additional internal sessions.